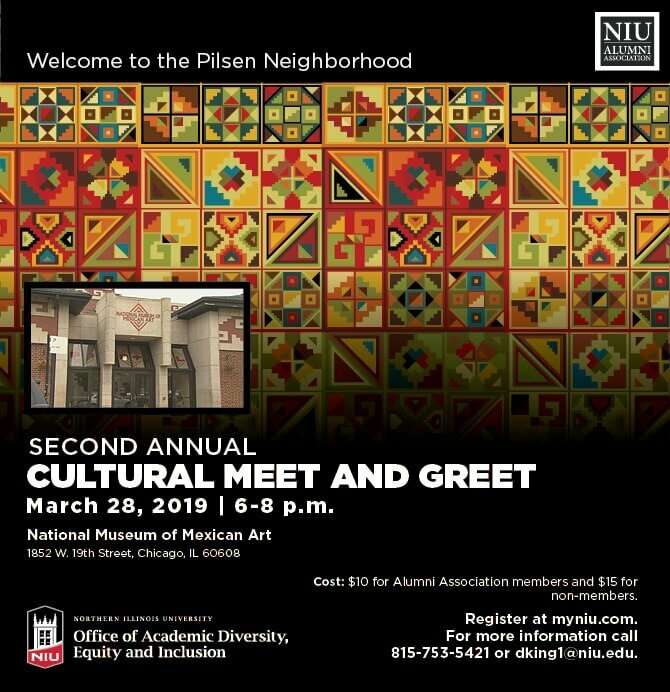 NIU alumni looking to network with fellow Huskies and learn more about the university’s exciting programs and initiatives are invited to a Cultural Meet and Greet on March 28 at the National Museum of Mexican Art, 1852 W. 19th St. in Chicago’s Pilsen neighborhood. Hosted by NIU’s Chief Diversity Officer, Vernese Edghill-Walden, the event is an opportunity to celebrate Huskie pride while enjoying the many exhibits and rich cultural history the museum has to offer. Monique Bernoudy, assistant vice president, Office of Academic Diversity, Equity and Inclusion, shared the sentiment. Along with alumni and prospective students, representatives from many of NIU’s resource centers will be on hand to share details about programs that make the university a vibrant and inclusive place to learn. “The focus on diversity and culture is important because it allows NIU to acknowledge the importance of building inclusive communities,” Bernoudy said. Representatives from areas including the Alumni Association, Asian American Resource Center, Black Alumni Council, Center for Black Studies, CHANCE Program, Disability Resource Center, Gender and Sexuality Resource Center, Latino Alumni Council, Latino Resource Center, Military and Post-Traditional Student Services and Office of Undergraduate Admissions will field questions during this fun and informative event. In addition, some of the university’s biggest brand advocates happen to be NIU employees. “We know that there are a number of faculty and staff who are also NIU alums and we want them to be part of this celebration,” Edghill-Walden said. “The National Museum of Mexican Art has given us a great opportunity to celebrate culture and the arts in a way that brings people together.” The Cultural Meet and Greet takes place from 6–8 p.m. on March 28. The cost is $10 for NIU Alumni Association members and $15 for non-members and can be purchased online. For more information, visit NIU Alumni Association or the Office of Academic Diversity, Equity and Inclusion calendar page.